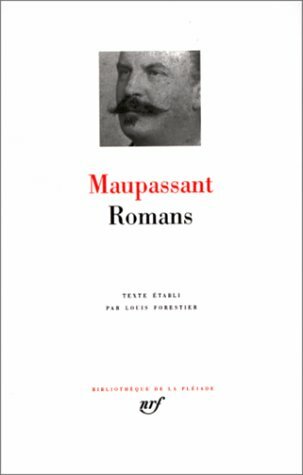 This edition brings together the six novels that Maupassant published and a shorter manuscript that he did not. The novels reveal a Maupassant obsessively circling around the theme of careless love, mostly of the unfaithful kind. "Bel-Ami" gives us the Parisian career of George Duroy, former army man turned journalist, for whom well-placed married women, when not vanity-enhancers, are means of ascent. "Une Vie" is written from the perspective of the naive wife of a countryside type of Duroy, a man whose choice of lovers is more limited and less fortunate; it also introduces one of those great themes of the family novel, the spoiled son running through a minor fortune. "Pierre and Jean" examines how infidelity drives a family apart even years later, when one of two sons receives a mysterious bequest at the death of a rich family friend. "Mont Oriol" is almost Balzacian in its exploration of how Parisian investors seek to exploit the family that owns a spring with supposed healing qualities. This may be the most complex of the group, as the urban contingent and the rural property owners thrust and parry and ultimately barter using anything at hand: aristocratic titles, doctors whose professional opinion is for hire, people with illnesses, women available for marriage. At its center is a woman makes the mistake of believing declarations of love while her husband manipulates everyone around him (including her lover) seemingly without noticing his wife's affair. "Strong as Death" follows the theme of inconstancy; as the superficial beauty of an aristocratic woman in a long-term affair faces, she watches her artist lover fall for her adolescent daughter. "Our Hearts" is the last of the novels and the outlier here; after all the heroines who love foolishly, it is refreshing to find one who says that, while she loves the man pursues her, it is simply not in her nature to love unreservedly. Taken as a whole, the rest of the novels support that position; in each one, one or more women have to pay dearly for making that mistake. It may not be the wisest thing to read the novels together (particularly with the manuscript, found among the papers of Maupassant's mother at her death, which proves at some length that at least some of the work of one of the nineteenth century's great writers does not travel well from the past); the thematic repetition appears almost like a fear of love and a conviction that it will end in betrayal. Some of the shorter works (not the one in this collection; I am thinking specifically of "Boule de Suif") seem, although more economical in execution, wider in their concerns, more precise in their observation, more surgical in their criticism. Maupassant died isolated and of syphilis, and that his chose epitaph reads, "I have coveted everything and taken pleasure in nothing"; the novels, taken as a whole, seem consistent with that statement and that life. "the accident that happened to the horse"
Guy de Maupassant - Henri René Albert Guy de Maupassant was a popular 19th-century French writer. He is one of the fathers of the modern short story. A protege of Flaubert, Maupassant's short stories are characterized by their economy of style and their efficient effortless dénouement. He also wrote six short novels. A number of his stories often denote the futility of war and the innocent civilians who get crushed in it - many are set during the Franco-Prussian War of the 1870s.